John Patrick Campbell was born in Belfast and trained as an artist in the Belfast School of Art. Some of his earliest illustrations appeared in Irish text publications of the Gaelic League under the name Seaghan MacCathmhaoil. 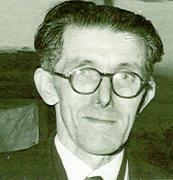 He was involved in the Ulster Literary Theatre and was an actor as well as designing costumes. He reproduced a portrait of Sir Samuel Ferguson for the centenary of the poet's birth, and he illustrated Mary A. Hutton's The Tain. In 1911 he emigrated to the United States and during his stay there, illustrated many books, however, his greatest achievement in the memories of those who knew him there, was an Irish pageant produced in the Armory, Thirty-first, New York.